How to explore the wildly beautiful outback in Northern Territory’s Nitmiluk National Park… one step at a time. Words by Cilla Cole. It is perfect. Cascading waterfalls bubble over whirling spa pools, which spill into an infinity-edged rock pool. Pink lilies gather at the rim where a water dragon basks in the sun. The pool is deep and cool with fresh, sparkling water. And we have it all to ourselves. We have arrived at Biddlecombe Cascades, the first campsite on our five-day walk along the Jatbula Trail in Northern Territory’s Nitmiluk National Park, and it feels so good to be here. Although it is only lunchtime and we are just 10 kilometres north of our starting point at Katherine Gorge, already everyday routines and the trappings of civilisation feel a long way away. I watch my four children splash and dive exuberantly. While I take a moment to soak in the scenery, they have wasted no time jumping in. Kids can’t ever just swim. They slide down the cascades, leap from rock ledges, ride the current and shower under the pelting water. “Be careful of the undertow!” I call out, futilely. They don’t stay above the water long enough to hear me. Outback and water don’t always mix, but they do on the Northern Territory’s Jatbula Track. “Watch this!” they shout over the thunder of the cascades, before all four duck dive under. Christopher, 15, re-emerges first, bare bottom leading. Apparently the force of the waterfall is strong enough to undress you. One by one they pop back up, their heads bobbing in the bubbles. I count them: one, two, three… My eyes scan the surface: calmly at first but quickly accelerating to frantically. I strain to peer into the churning depths at the base of the waterfall. No sign of her. Where is she? It’s been too long! My heart pounding, I am about to dive in, boots and all, when I see it: a hand. It is poking through the curtain of cascading water, waving at me. The other hand appears, followed by a beaming face. My 13-year-old daughter hasn’t drowned. She is happily sitting on a rock ledge hidden behind the waterfall, cocooned in a cave of water and totally oblivious to my panic. I take deep breaths to calm my heartbeat and smile with relief, not only because we still have the same number of children we started with; I am also relieved to see them having such a good time. When I had originally made the suggestion that we go on a 60-kilometre walk over five days in 35-degree heat, carrying all our food and equipment, our children weren’t exactly bursting with enthusiasm. In our household, as is common in many families, “walk” is a four letter word and seems to invoke instant lethargy. I had first heard about the Jatbula Trail five years ago when our family had enjoyed a canoeing trip on the Katherine River with Gecko Canoeing and Trekking: a small, locally-based tour company. 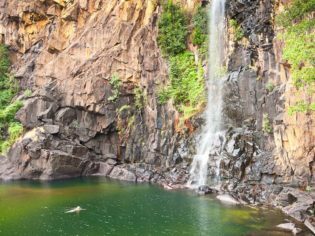 Named after Peter Jatbula, a Jawoyn elder instrumental in securing land rights for his people, the track follows a route travelled by generations of Jawoyn between Katherine Gorge (30 kilometres north-east of Katherine) and Leliyn (Edith) Falls. Gecko had been guiding the then-little known trail since 2001 and their descriptions of walking through wilderness and sleeping under the stars next to a different, isolated waterhole each night captured my imagination. “You’ll have to come back,” Gecko’s owner, Mick Jerram had said, “when the kids are older”. Since then the trail has grown rapidly in popularity. Answering demand, the limit of daily permits issued has been increased from 10 to 15 and Gecko has been joined by World Expeditions in offering guided tours. I was keen to experience the Jatbula Trail before it became too well known; too well trodden. And now the kids were older. But was the youngest, at eight, old enough (to be capable)? And was the oldest, at 15, too old (to be agreeable)? “They’ll be fine,” said Mick, in his typical ‘nothing’s-a-problem’ fashion. And, it appears, he was right. I am not the only one relieved. The other members of our group are Johan and Elizabeth: fit, strong, experienced walkers who, being recent empty nesters, had looked aghast when first introduced to their young walking companions. They now join us at the rockpool and together we watch the boundless energy of the children who are apparently unfazed by the challenges of this morning. “You forget how resilient kids can be,” Johan observes. He is right. You do forget. I had also forgotten how unfit I was. I had been so concerned about how the children would cope; I hadn’t considered my own abilities. By lunchtime today I was red-faced, my legs ached and I was feeling every gram of those lunch wraps I was carrying. Although, I have to admit that the Jatbula Trail is not a difficult walk. Traversing the Arnhem Land Plateau, the well-marked path is generally level with designated campgrounds and toilet facilities. The furthest we would walk in one day would be 16 kilometres and the longer days would be broken up by a refreshing lunchtime swim. “I call the Jatbula Trail a destination walk,” explains our guide Matt Leigh. By this, he means it is not so much about navigating a challenging scenic track, but more about the end points: the ancient rock art amphitheatre and the spectacular (crocodile-free) waterfalls and swimming holes. We find this actually suits our group, allowing us to all walk at our own pace and allowing more time to enjoy the gorges each afternoon. It would, in hindsight, be quite easy to walk the trail without a guide. We are glad, however, to have the company of Matt, a laidback carnivore from Queensland, who has been leading tours in Nitmiluk and Kakadu National Parks since he joined Gecko three years ago. Despite setting a bad example by admitting he hasn’t eaten fruit or vegetables since age four, when his mum gave up trying, Matt’s knowledge of the local flora and fauna, of bush medicine and Aboriginal culture, greatly enhances the journey and appeases our guilt of taking the children out of school. And Matt is fit and strong and burdens the bulk of the load. His enormous pack is heavy with emergency supplies and equipment, which he carries tirelessly like a Nepalese sherpa, allowing us to travel comparatively lightly. The dependable clear skies of the dry season mean we need little in the way of clothes or shelter (we sleep under mosquito nets at night) and drinking water is abundant en-route. “Something to eat? Something to cook with? Something to sleep on?” was Matt’s check list before departure. His relaxed nature is contagious and we take on the challenge of getting back to basics and enjoying the freedom that comes with it. Not that our boys find this a challenge. They revel in the thought of not having to shower or change for five days. Instead, they ‘wash and wear’ under the waterfall. Matt shows us how to make soap from acacia seed pods and 12-year-old Fergus watches the lather form between his palms in astonishment. “Why aren’t you coming in?” calls eight-year-old Claudia as she is swept past me, riding on a mini rapid. I dive in to join them. The water is cool and cleansing and I surface with a contented sigh. This may be a destination walk, but what a destination! Over the next five days we visit so many beautiful destinations, we are unable to agree on a favourite. Christopher enjoys the bubbling spas of Biddlecombe, my husband Richard is partial to the many layers of Crystal Falls, Elizabeth takes ownership of the pool she discovers chasing her sock over 17 Mile Falls and I like the peaceful reflections of Sandy Camp Pool. Julia, of course, votes for the water cave. 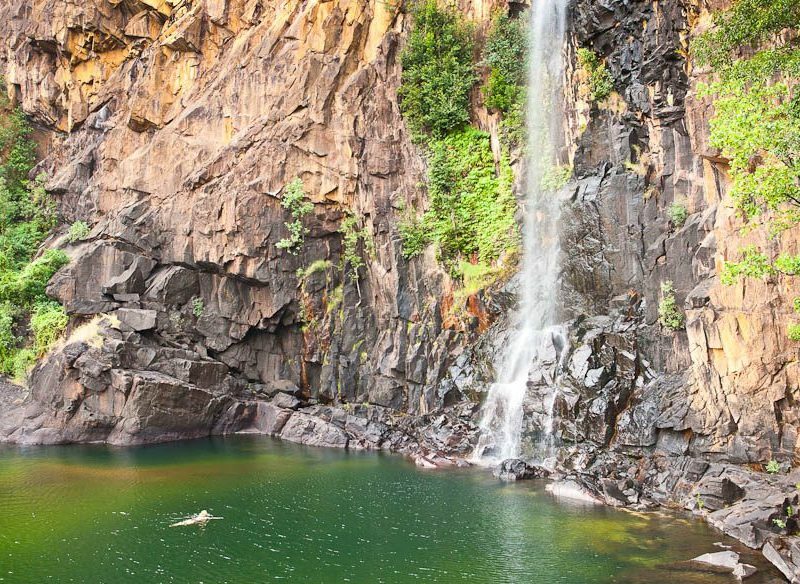 Certainly there are plenty of impressive gorges and rock art galleries in more accessible sites of northern Australia. But like handmade gifts, we appreciate these all the more for the effort it has taken us to get to them. By the end of the five days we gain an affinity for this beautiful land and feel privileged that the Jawoyn people have shared it with us. I had worried the children might struggle with the walking, the weight of their packs, the heat, the limited fresh food supplies and the discomfort of the primitive camping. I had not anticipated them becoming spoilt. Gecko Canoeing and Trekking tours start in Katherine early on the first day so you’ll need to stay the previous night. Gecko offers a range of options from a five-day guided walk departing Katherine, providing your own food and equipment, to a fully inclusive six-day package from Darwin, which includes all transfers, a cultural tour (recommended) and a gorge cruise, plus any combination in between. World Expeditions have six-day fully-inclusive packages that depart from Darwin and begin the trail at lunchtime. The Jatbula Trail is generally only open during the dry season, from June to September. Strong hiking boots are recommended but other than a long-sleeved shirt, hat, and a spare pair of socks, you really don’t need to take much in the way of clothes. We found thongs handy for walking around the campground but don’t, as Claudia did, wear them for crossing rivers: you may end up with only one for the rest of the trail.